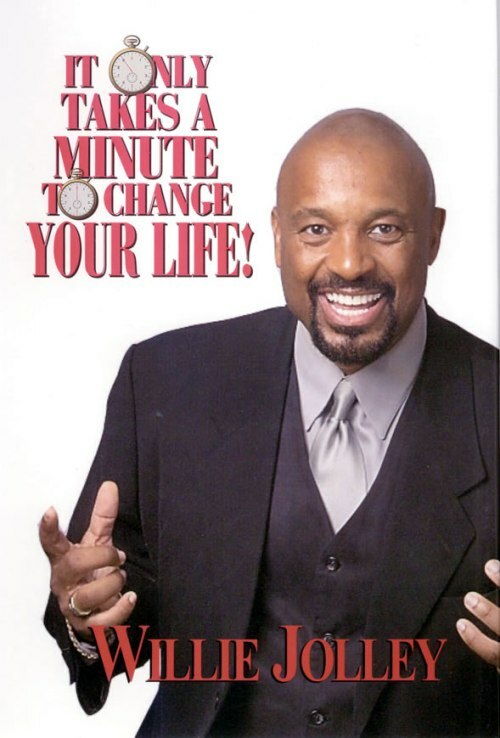 Coming from humble beginnings, Dr. Jolley has made a name for himself as an author, speaker, and media personality. 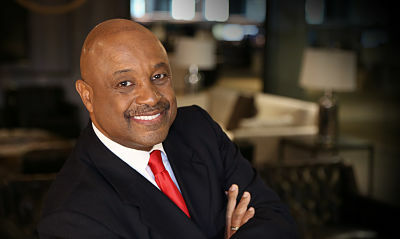 Dr. Willie Jolley has many talents, but is best known as an award-winning motivational speaker. As a speaker, Dr. Jolley has been named “One of the 5 Outstanding Speakers in the World” by Toastmasters International. He has also been inducted into the prestigious Speaker Hall of Fame as well as achieving the distinction of Certified Speaker Professional by the National Speakers Association. In addition, he is the author of several international best-selling books including It Only Takes A Minute To Change Your Life, A Setback Is A Setup For A Comeback, Turn Setbacks Into Greenbacks and An Attitude of Excellence. In addition to being a successful author, Mr. Jolley encourages everyone to rise above their circumstances and maximize their potential by empowering themselves by hosting radio and television programs! He is an expert in motivating people to achieve greatness, a mission that Amazing Kids! also strives to accomplish. Continue reading to gain some valuable insights from Mr. Jolley. Amazing Kids! (AK): Describe the moment that you feel made the greatest impact on your life? Dr. Willie Jolley (WJ): The moment that had the greatest impact on my life was the moment I decided to turn my setback of being fired, into a comeback. I was a nightclub singer and I had built the #1 nightspot in Washington DC. One night the owner told me that they loved the band but needed to make a change because it was more cost effective. They had bought something that was filling up nightclubs and was cheaper than a band…they had bought a karaoke machine. It was in that moment that I decided to stop letting someone else determine my destiny! AK: When did you begin speaking to audiences and how did this become instrumental in your career? WJ: I began speaking to young people in schools, talking about staying away from drugs and negative people and pursuing academic excellence! I would speak every day and would sometimes give as many as 5 speeches per day to schools in various cities across America. In my first 10 years of speaking, it is estimated that I spoke to over 1 million young people. From there I did a PBS Special for young people that has gone on to become one of the top selling youth DVDs in the country, then on to college students, then associations, then corporations and now I am one of the featured speakers on the national Get Motivated Tour that goes to big arenas across America. AK: In your book It only Takes a Minute to Change your Life you give one minute messages to inspire people to be their best. What are 2-3 of your favorite messages that have inspired you? Today’s step for success is that we must see every day as an opportunity that demands that we give our all, do our best. We must see success not only as a destination, but also as a journey that is constantly filled with adventure and challenges. If we are willing to meet those challenges, then we can live life to the fullest. Friends, every morning in Africa a gazelle wakes up and knows that it must run faster than the fastest lion or it will be killed and eaten. Also every morning in Africa a lion wakes up and knows it must out-run the slowest gazelle or it will starve to death. It doesn’t matter whether you are a lion or a gazelle, when the sun comes up you’d better be running! Remember that all things are possible if you can just believe. This is Willie Jolley, have a Great Day! Every day is a brand-new day, a day unlike any other day, a brand-new opportunity to make your dreams come true. But in order for your dreams to become true, it is necessary for you to have a dream. You’ve got to have a dream, a goal—not just a resolution that you make on the first of January and forget by the fifteenth, but a goal, a target, a destination that you have made a commitment to. It is critical that you have a dream. Dr. Benjamin Mays said it so well when he said, ‘‘It must be borne in mind that the tragedy of life doesn’t lie in not reaching your goal. The tragedy lies in not having a goal to reach for. It isn’t a calamity to die with dreams unfulfilled, but it is a calamity not to dream. It is not a disaster to be unable to capture your ideal, but it is a disaster to have no ideal to capture. It is not a disgrace not to reach the stars, but it is a disgrace to have no stars to reach for. Not failure, but low aim, is sin!’’ Ladies and gentlemen, most people have low aim or no aim and make little resolutions that they don’t stick to. If you aim at nothing, that is probably what you will hit! Aim high, dream big dreams, set big goals, and, remember, all things are possible if you can just believe. CAN WE CHANGE THE WORLD? THE ANSWER IS YES! Many people are concerned about the state of the world and are discouraged because they do not know that one person can make a major difference. One person can change the world. This thought, by an anonymous writer, shows that each of us can make a difference: ‘‘When I was young my imagination had no limits, I dreamed of changing the world. As I grew older and wiser, I discovered the world would not change, so I shortened my sights and decided to change only my country. But it seemed immovable. As I grew into my twilight years, in one last desperate attempt, I settled for changing my family, those closest to me. But alas, they would have none of it. And then as I laid on my deathbed, I realized if I had only changed myself first, then by example I might have changed my family! From their inspiration and enthusiasm then they could change the community, who could then change other communities, which would then change the country. If the country could be changed, then the world could be changed.’’ The key to changing the world was to make the decision to first change ourselves! AK: After learning your lessons through your speeches or books, what should be the first step to changing a person’s life for the better? WJ: The first step is to start to dream again! When we are children we dream about being astronauts or firemen or some other exciting occupation, but as we grow older we stop dreaming, either because someone tells us our dreams are not possible or we tell ourselves. Yet, those who are the most successful are those who find a way to continue to dream big dreams, and have optimism and hope that moves them to make those dreams into realities. You must dream and then act on those dreams! AK: What are some of the biggest obstacles to people becoming successful? WJ: Fear and Small Thinking! Fear and small thinking will kill your dreams and shackle you and keep you from trying to achieve big results! I encourage people to read my book It Only Takes A Minute To Change Your Life so you can read about the ways that are available to overcome fear and small thinking and go on to have big success! AK: When you help companies make a comeback by speaking to their employees, you talk about thinking, working, and winning like a team. In school students frequently have to work in teams in order to prepare themselves for the real world. How can students use teamwork in school to be successful? WJ: Yes, you should be developing team thinking even in school. Those who learn the power of teams tend to succeed more often. So for students to see team success in their school life they could use it in studying together, doing cooperative projects, in school leadership programs and in sports activities. The list is endless in how you can use teamwork to have greater success in school, the key is that you start thinking like a team and then you will start to win more! AK: Can you describe your win/win mindset? AK: You talk about the C’s for Success. Can you describe how change, challenge, and choices are important to grow into the person each of us can be? Also, you speak of the three Ds (Dream, Decide, and Do). How will these change a person’s direction in life? WJ: You will have change in your life, and often that change comes with challenges, but whether you succeed or not usually comes down to your choices. You had change when you went from crawling as a baby to standing and walking, and it was challenging because you often fell down, but you made a choice to get back up and try again and that is how one learns to walk and eventually run! There are 3 D’s that can have a profound impact on your life. Dream, Decide & Do. If you are going to maximize your success you must have a Dream. Dreams are the seeds for success. Then you must Decide! You must decide to stay away from negative people, places and things that will derail your success! And finally you must Do, you must take action! A dream without an action is an illusion! But a dream and action put together can change your destiny! AK: How is communicating with your audience different between writing your books, appearing on your TV program, speaking or being on the SiriusXM Radio program? WJ: I am grateful that I have a number of ways to reach people and inspire them. I use my books, TV, radio and live events, but at the end of the day it is all about helping people to do more, be more and achieve more! AK: You have also branched out into giving financial advice to parents and youth (as seen in this month’s Money Matters column. Why is gaining control of finances important in achieving success? 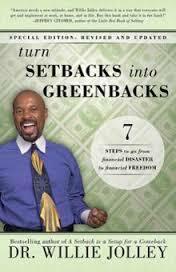 WJ: In my new book, Turn Setbacks Into Greenbacks, I share 7 tips to get control of your thinking so you can have more finances. There is an old saying that states, “A fool and their money will soon part ways!” If you are not willing to learn more about finances, then that is foolish and it is just a matter of time before your money starts to disappear. So if you want to make a difference in the lives of your family and friends and want to have finances that will keep you and sustain you, then you need to continue to learn and grow in regards to those finances. AK: Who has been one of the biggest mentors in your life? WJ: Both Les Brown and Zig Ziglar had great impact on my life! Both are great mentors and friends! AK: Thank you, Dr. Willie Jolley for speaking with us. We know your words of wisdom will inspire thousands of our readers to pursue their potential. As you have said, “Developing a winning attitude, determines your altitude.” We hope your advice will help all of us adopt a winning attitude that will let us achieve our dreams.